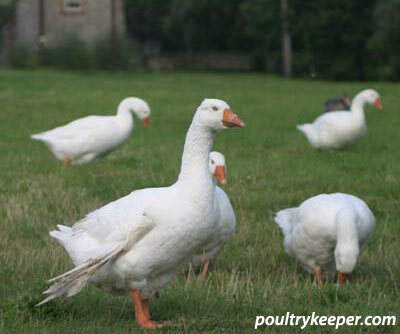 Angel wing is a condition that affects ducks and geese and is sometimes called slipped wing, or dropped wing. In the wild, waterfowl live mainly on grains and grass but modern high protein feeds can cause a this condition of the wing joint to occur in growing waterfowl. Goose with Angel Wing. It is too late to correct the problem in adults. Angel Wing is where the wing joint deforms and twists, the growing primary feathers are full of blood and the weight can cause the wing joint to twist and the wings to droop. This causes the feathers to stick out at a funny angle, usually away from the bird’s body. Unfortunately there is nothing that can be done in adult birds as the wing joint will remain deformed and some of the primary feathers will always stick out. If you catch it early enough in young growing birds, it can be fixed. At the first sign of Angel Wing, the wing should be taped into the correct natural position for 3 days (masking tape is good for this). The diet should be changed to a lower protein diet. Feeding wheat with pellets can also accomplish this. In the wild, Angel wing is rarely a problem but will occur in waterfowl kept on public ponds where they are being fed high protein foods.